A vocal microphone pack designed for streamers, podcasters, and other content creators. 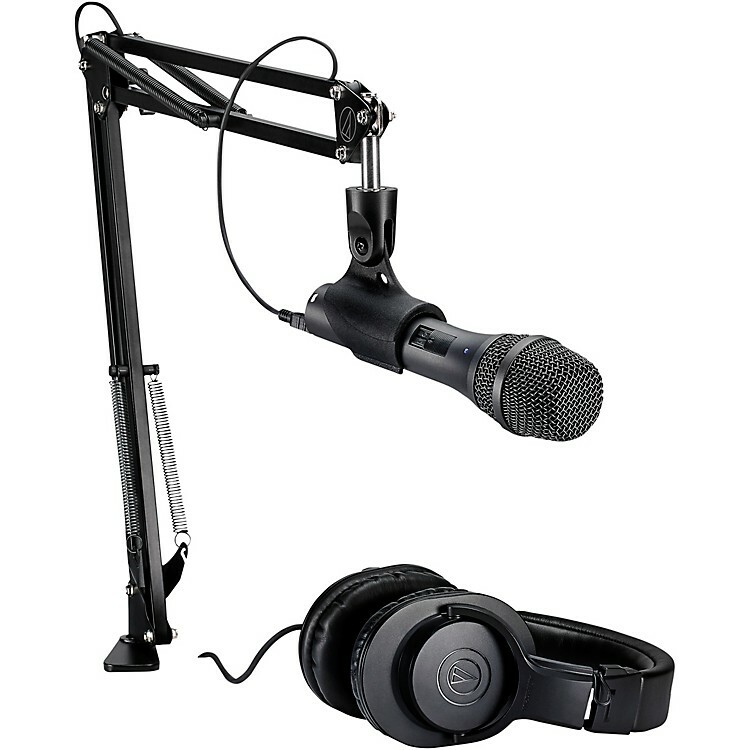 The AT2005USB Podcasting Studio Bundle is designed for streamers, podcasters, and other content creators who need a versatile, easy-to-install, easy-to-adjust boom microphone setup. The pack includes an AT2005USB cardioid condenser microphone, a pair of ATH-M20x professional monitor headphones and a studio boom arm threaded with an XLR cable. Audio-Technica's AT2005USB is an all-purpose microphone designed to take you from the stage to the studio and beyond. This rugged handheld microphone offers two outputs, USB output for digital recording, and an XLR output that connects with a sound system's conventional microphone input for use in live performance. The microphone plugs right into your computer's USB port, and functions seamlessly with your favorite recording software. The M-Series headphones are a reliable source for monitoring in home and professional studio environments. Because of the increased demand due to the popularity of the ATH-M50, Audio-Technica refreshed the entire line of these closed-back studio headphones for a redesigned feel. The ATH-M20x professional monitor headphones are a great introduction to the critically acclaimed M-Series line. Modern design and high-quality materials combine to deliver a comfortable listening experience, with enhanced audio and effective isolation. An excellent choice for tracking and mixing. The adjustable studio boom arm clamps securely to desks, tables and other flat surfaces up to 2.2" thick. The boom is equipped with a standard 5/8"-27 thread for easy attachment of the included pivoting microphone stand mount, and the XLR cable is threaded internally for a clean appearance and unhindered operation. Offering full 360° rotation and adjustable, spring-stabilized joints, the boom arm repositions quickly for optimal mic placement.